Rollin' down the river with Proud Mary and her krazy krewe! : Happy Birthday Liam! I really didn't think that on October 12th that Liam would be born. Call me naive but I really thought I had more time to keep on cooking baby Liam. I was nervous every appointment with my high risk doctor but I just really thought I'd make it to 32 weeks. Boy, was I ever so wrong. I woke up on October 12th like any other day, it was actually picture day for Noah at preschool. So I picked out a cute little outfit for him to wear and Clint took him to school. Clint then went to work as I woke up and began to get ready for my 11:45 appointment. The whole night I was up tossing and turning and praying constantly to have a great appointment. While getting ready I was jittery and nervous but was positive that today wasn't the day. During the ultrasound I just kept on praying Hail Marys constantly in my head over and over. I barely even glanced at the screen because I was so deep in hopes to send myself positive thoughts. I was only 27w6d...I still had tons of time to go. His due date was January 5th, he wasn't supposed to be an October baby. Our appointment was for 11:45 and a little after 12 our doctor decided it was best to deliver today. Well, I thought I had some time. I mean...not everyone was ready RIGHT NOW, right? WRONG! I thought it took time to rally up an anesthesiologist, my OB, a neonatologist, etc...again I was so wrong. When my doctor walked out to call my OB to tell her it was time, I started crying and shaking with fear. Now? They are going to take the baby now? Like today? I kept on thinking I'm not ready...I'm not ready. The baby isn't ready, this can't be happening today. I then began to think, oh gosh can I say no? Can I scream like a crazy person and say "I object!"? Of course, I didn't do either and just went with the flow while I was crying and shaking like a crazy person. My high risk doctor came over and gave me a hug and sent me with a nurse over to labor and delivery. "Today is your baby's birthday!" the nurse said all excited while I just walked slowly in fear while holding back my tears. I glanced at the clock and it was 12:20. Once in the room it was attack of the green people, I kid you not. I had one nurse hooking me up to a fetal monitor, the other one taking my blood pressure, another nurse making me sign TONS of releases, a nurse taking my blood and the anesthesiologist explaining to me he was going to have to knock me out for the entire procedure. Woah...it was all so hard to digest and I was the most scared I have ever been. Here I am signing my life away and then a NICU nurse practitioner came in explaining everything about what he would do after delivery. I think I caught 1/10th of what he was saying while another nurse poked and prodded me a million times to find a vein and ended up in my hand again (just like with Noah and it sucked!). Thankfully I didn't have to be completely knocked out and the plan was to give me a spinal. I was then rolled into the OR to get the spinal, Clint had to stay outside. I remember just being scared and hopeless. It took a good amount of time and I kept on thinking, why is this taking so long? Well come to find out I had an epdiural and a spinal and I still don't know why I had to have both. The back pain in the days to come from both of them was miserable. OUCH! After that was done, Clint was brought in and then my OB. I felt like the whole procedure lasted forever. I felt that by the time Liam was delivered an eternity passed by. Once he was born at 1:11, we heard a few tiny teeny squeaks! It was the best sound. I didn't get to see him and they just whisked him away to the NICU. It was one of the best and saddest times of my life in the sense that he was born squeaking but that I didn't even get a glance of my new baby. The whole procedure felt like a lifetime. I just wanted to get up, walk out and go check on my baby. My mind kept on racing and thinking about him while I felt my insides being pulled around (worst feeling I tell you!). I even asked a few times "Are we done yet? ", I wasn't very patient. When they were finally finished I was rolled into my recovery room and my parents, sister and mother in law were all in there. Phew, it felt good to see my family. Everyone was very worried about Liam and nobody had any answers. Thankfully, the NICU came by and gave updates that he was stable and explained that they were doing. I felt a bit more relieved. My sister and brother in law then arrived from driving in from Mississippi. I was soon brought into my room that I would stay at for the remainder of my stay. It was good to have my sister Robin there because I was expected to start pumping immediately. She was able to help me with it, which was great. I felt like the rest of the night was a blur. I was so sad to be on the regular delivery floor because I heard random cries from newborns which would just take my breath away. I so badly wanted to hold Liam and to hear him cry, so that was really tough. 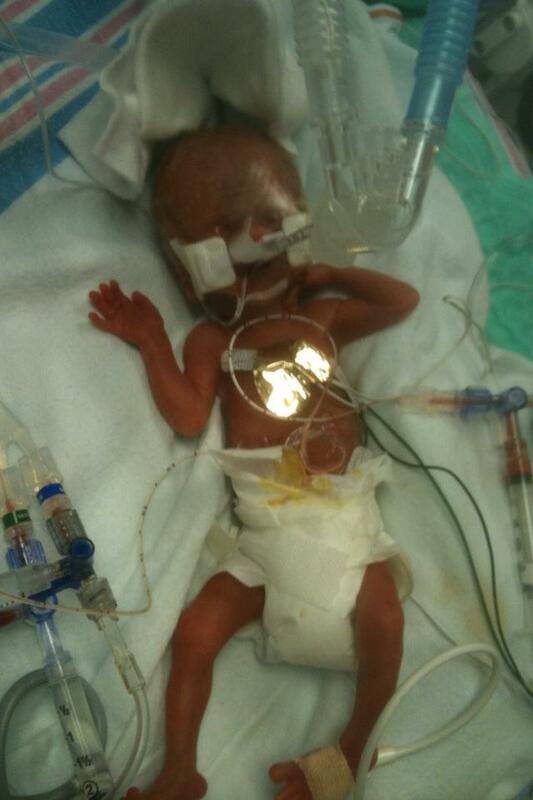 Luckily Clint was able to visit the NICU and get a picture. Here is a picture of Liam on his birthday. Liam born 10/12/11 at 1:11PM weighing in at 15oz and 11 inches. you are so strong Mary!! And I'm so glad he's doing well! Nothing wrong with things coming in small packages. This post brought tears to my eyes.